Taking care of your beautiful, yet challenging black skin is no easy task, and some hyperpigmentation issues sure raise the bar for finding the best choice for it. What is Mesoestetic Cosmelan 2? What are the main ingredients within its formula? How to use it? Does it leave a nice feel onto your skin? What are the ups and downs of the cream? What’s our final take on the cream? The lightweight cream is an efficient lightening cream that is created for minimizing hyperpigmentation. 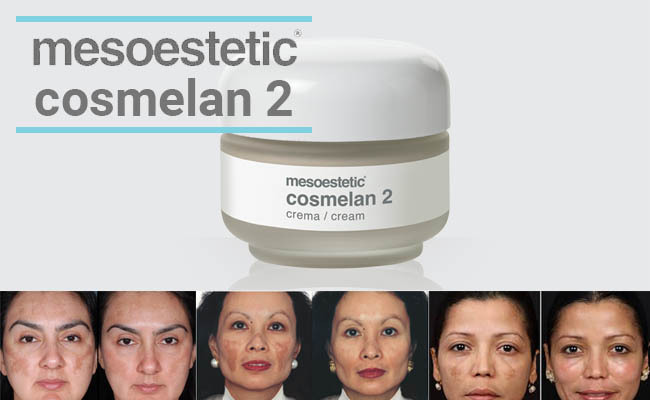 Mesoestetic Cosmelan 2 helps your skin get back its radiant look and clarity, as it evens the skin tone. 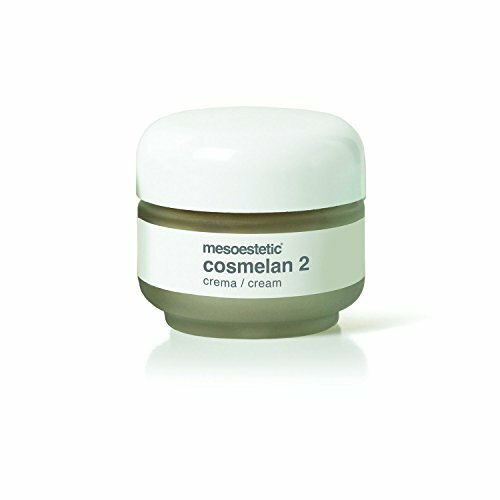 You can use the cream as a maintenance cream after applying the Cosmelan 1 Mask. The cream addresses discoloration, dark patches and brown spots and is a reliable option for treating acne, lentigo or cholasma. Azelaic acid- it fights against acne and has anti-inflammatory abilities. It’s a miracle worker against hyperpigmentation and it’s naturally present in skin. It’s safe to use on all skin types as it’s strong, yet gentle on the skin. It’s a good ingredient for the sensitive skin too. It calms and sooths an irritated skin and brings comfort in rosacea. It clears up the skin and lightens dark spots. Niacin amide- it’s in fact vitamin B3 and nicotin amide. It enlarges pores and improves the overall appearance of skin. It evens the skin tone and diminishes the looks of fine lines and wrinkles. It eliminates dullness from skin and protects it from the environmental damage. It hydrates and moisturizes the skin and softens skin. Kojic acid-it lightens skin and whitens age spots and scars. It’s anti-microbial and anti-fungal and keeps acne under control. It fights against premature aging of skin and it’s safe for many. Aloe Vera- it diminishes the appearance of stretch marks and keeps aging at bay. It alleviates symptoms in psoriasis and eczema and fights against acne too. It moisturizes the skin and sooths sunburns. Allantoin- sooths and repairs the damaged skin. It’s non-irritating and great for the sensitive skin. Citric acid-unclogs pores and eliminates wrinkles. It evens the skin tone and it’s great for the acne-prone skin. It also diminishes the appearance of sun spots. Alpha arbutin-it’s found in bearberry extract and whitens the skin tone. It corrects hyperpigmentation and minimizes the appearance of freckles, melasma, age spots and acne scars. It protects against sun’s bad UVs and it’s non-irritating, which makes the cream safe for the sensitive skin. The formula is powerful, yet gentle. It doesn’t include any caustic chemicals or hydroquinone. It’s safe to use on all skin types and leaves the skin toned and radiant. The cream is easy to apply and you should pay attention to your skin’s reaction to see if you should increase/decrease the dosage. The nice smooth consistency of the cream makes it go easily into your skin. The cream moisturizes and renews the skin, making a great base for your makeup. We like the cream as it gives results right away, peeling the skin lightly only to allow the new, toned and younger skin to show. Keep in mind to follow it with a good moisturizer as the cream may be drying at first. Additionally, if you ever experienced an allergic reaction to retinol or hydroquinone, it’s safer to make a patch test at first. As it peels lightly the skin, one may not go for this kind of effect. Keep in mind though that this happens only in the beginning and a moisturizer can easily solve the issue. As it’s loaded with whitening ingredients, we like the cream for its efficiency and reliability. It removes the dark spots of various causes and leaves your skin more radiant and healthier looking. One could argue there are cheaper options out there that also work, but why wouldn’t you treat your skin with something that’s proven to work well? Recent reviews: the Shiseido White Lucent Spot Corrector, the Clinique Deep Comfort Body Lotion, the Neocutis Perle Skin Brightening Cream, the Nars Pure Radiant Moisturizer, Chantecaille Blanc Gardenia Brightening Essence review.